In Buddhism, parinirvana (Sanskrit — Pali: Parinibbana — Chinese: 般涅槃; Pinyin: bō niè pán) is the final nirvana, traditionally understood to be within reach only upon the death of someone who attained complete enlightenment. 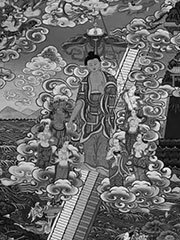 It is the ultimate goal of Buddhist practice and implies a release from the cycle of deaths and rebirths as well as the dissolution of all mental aggregates (form, feeling, perception, mental fabrications and consciousness). The parinirvana of Gautama Buddha is depicted in the Mahaparinibbana Sutta and the Mahaparinirvana Sutra.